I have a Starcraft tent trailer with 10-inch Fayette electric brakes. I bought it used. The original owner did not hook the electric brakes to a brake control line. He spliced it into the line for the taillights. Needless to say, I need to rewire it so it will work properly with my brake controller. I would like to know if it matters which of the two wires on the electric brakes is connected to the hot wire from the brake controller and which one is the ground. Also, do the lines for the electric brakes need to have fuses on them? Should the fuses be auto reset fuses? If so, what amperage? I was also told that the electric brakes should be wired in parallel, not in series. Is this true? If so, should each part of the parallel circuit have its own auto reset fuse? Thanks for your help. Greg, I am amazed that fellow did not experience smoldering wires! You are wise to use the brake controller. It matters not which wire of each magnet is wired to hot or to ground; there is no polarity involved within each magnet. Do not fuse the blue brake wire from the controller through the plug to the brakes, but do install a 20-amp automatically resettable circuit breaker on the hot wire that powers the controller. 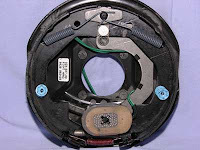 The magnets are indeed wired in parallel with one wire from each magnet wired to the blue “hot” line and one wire from each magnet connected to the ground circuit at the plug. Do not use a frame ground, but be sure the connections at the plug between the trailer and the tow vehicle are clean, dry and tight!